Our annual artist development grants program provides emerging and established artists an opportunity to construct manage and present new work to a large audience in a natural, outdoor environment. We encourage submissions that develop a high-quality, imaginative artistic practice; and can reach and engage with diverse audiences. We invite everyone to bring their creative ideas and unique flavour; and that participating in this program will encourage greater artistic expression and allow your unique artistic endeavours to come to life. The Artist Grants Program is to open to emerging and established individual artists/collectives who can display their artworks at the Rainbow Serpent Festival in Lexton, Victoria. This program supports individuals and collectives in developing new concepts in their chosen art form and to exhibit new work in a safe, professional manner. The Artist Grants Program encourages innovative original art that engages with people, decorates and enhances the Rainbow Serpent Festival grounds. Please remember that we are situated in the Australian outdoors and artworks must be able to withstand extreme weather conditions. All installations must be well lit at night in order to be viewed throughout the entire event. Submissions must be well thought out, and use materials that are conducive to the harsh conditions of the Australian outdoor environment (eg. high winds, rain and extreme UV(sun) and heat). Weather resistant materials must be used. Artwork must be viable to produce in an outdoor environment. Proposal must demonstrate all safety precautions are addressed. Installations must be transportable and be erected and dismantled by the applicant. Please take careful note of the selection criteria. You will need to address these points in your proposal for it to be considered. All sections of the online form are to be completed in order for your submission to be accepted. **Please specify in your application which funding stream you wish to apply for. It is important that adequate information is submitted with your application. This is so we can assess the applications with a clear and thorough knowledge of what you wish to produce and how it will be installed at the venue. 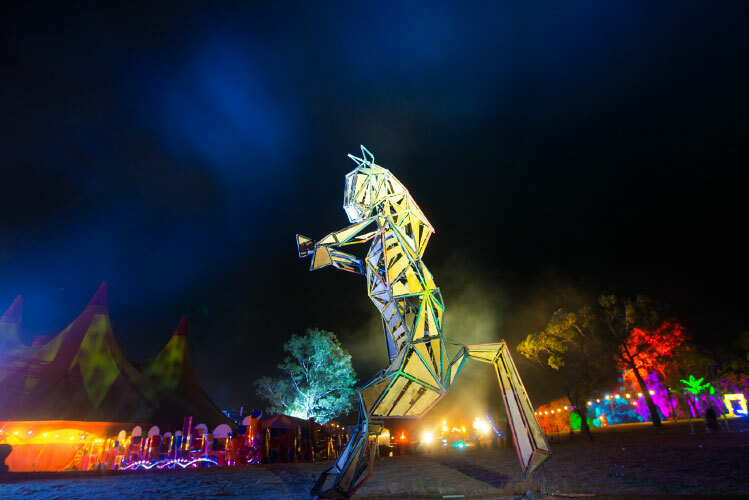 Safety is the most IMPORTANT aspect of installing your work at Rainbow Serpent Festival. You must demonstrate how you will address this in an area with high wind and extreme heat for the duration of the event! Early 2014, Gav Seed passed away after a hard fought battle with cancer. Gav was an inspiration to many, and was interested in projects that saw talented artists work together to achieve artistic goals through projection, sculpture digital and visual arts. The Memory Seed Multimedia Arts Grant is awarded to a project that embodies Gav’s visionary enthusiasm and passion for multimedia. Medium: Digital, Multimedia, Sculpture/ Installation, VJ, Interactive, Visual presentation. We are looking for artists who work between light and surface in the sculptural, projection, VJ, film, interactive and digital arts. The work will feature at Rainbow Serpent Festival as part of the artistic programming. The artist will also feature on our website and in highlighted in our promotional booklet. Rainbow Serpent Festival is held in the rugged outdoor environment of Western Victoria, Australia. It is exposed to high winds at times and baking sun. Access to site to begin building the work in situ is from 20th January 2018. Artists can have access to machinery such as EWP and Manitous however this cost will be passed onto the artist. Successful projects are to be installed onsite between Saturday 19th January and midday on Thursday 24th January 2019. All art installations are to be removed by 6pm Tuesday 29th January 2019. If you need to install your artwork at an earlier date this must be pre-organised. There is no rush to complete your application, please take your time to read the Application FAQs on the Rainbow Serpent Festival website before you apply and good luck with your submission.